ANGRAU AGRIENGGCET 2018 Notification -Agricultural Engineering Entrance Test Apply Schedule : AGRICET 2018 Notification, Exam Date and Application Form, ANGRAU AGRIENGGCET-2018 Entrance Test Schedule released @www.angrau.ac.in. AGRIENGGCET-2018: Applications are inviting from the 3-year Diploma holders in Agricultural Engineering for admission into 2nd year of four years B.Tech (Ag.Engg.) Degree Programme for the academic year 2018-19. 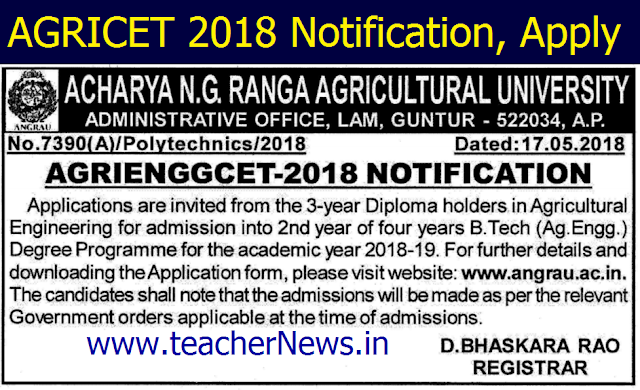 ANGRAU AGRIENGGCET 2018/Agricultural Engineering Common Entrance Test 2018 Notification/B.Tech Agricultural Engineering Degree Course Admissions 2018. For further details and download the Application form, please visit the website: www.angrau.ac.in. 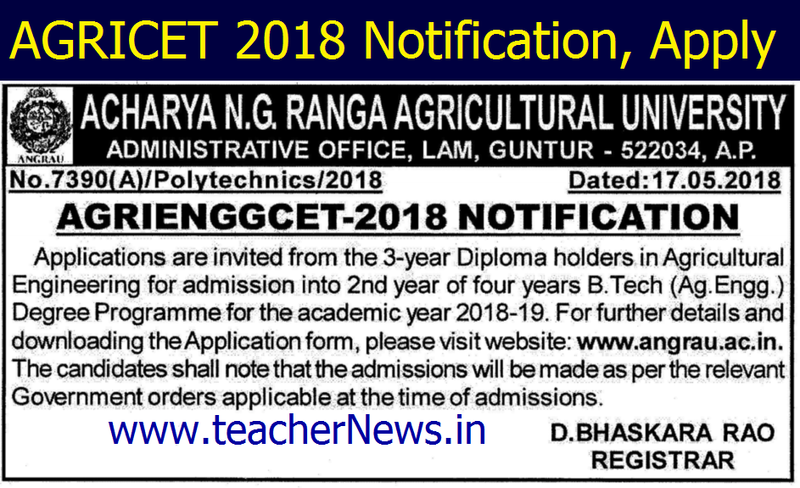 ANGRAU AGRIENGGCET-2018 Notification Entrance Test for 3-Year DIPLOMA in AGRICULTURAL ENGINEERING Passed Candidates For ADMISSION INTO 2 Year of 4 Year B.Tech. (Ag. Engg) Degree Programme for the Academic Year 2018-19. AGRICET 2018 will be conducted for candidates seeking admissions into Bachelor Degree (B.Sc Agriculture) courses in Acharya N.G. Ranga Agricultural University for diploma holders in Agriculture and Seed Technology. Acharya N.G. Ranga Agricultural University invites applications from Diploma holders in Agricultural Engineering for admission into 2 Year of 4.Year B.Tech. (Ag. Engg) Degree Programme through AGRIENGGCET-2018 for the academic year 2018-19. A pass in 3-Year Diploma in Agricultural Engineering from recognized Agricultural Univerity. ii ) The seats will be allocated in the ratio of 85 % for local candidates and remaining 15 % seats will be treated as an unreserved quota. Syllabus: Syllabus prescribed by the ANGRAU in the courses of 3-Year Diploma in Agricultural Engineering. The qualifying percentage of marks for the AGRIINGGCET-2018 is 25 % of the minimum marks considered for ranking. However, for candidates belonging to SC, ST no minimum qualifying mark is prescribed. The AGRIENGGCET-2018 will consist of only Multiple Choice Objective Type Questions and the answer in the answer sheet. The AGRIENGGCET Test will be conducted at College of Agricultural Engineering. Bapatla on 17-06-2018 (Sunday) from 10:00 AM to 11:30 AM. ANGRAU AGRIENGGCET 2018 Notification Exam Date Application Form link at www.angrau.ac.in. Agricultural Engineering Common Entrance Test 2018 Admissions Dates here.